DO YOU WANT TO DISCOVER NEW DRUGS FASTER THAN GLAXO AND MERCK WITHOUT SPENDING MILLIONS IN AUTOMATION? MULTIBLOCK works in big pharma laboratories (Astra, Bristol Myers, Ciba, Glaxo, E. Merck, Merck Frosst, Novo Nordisk, Organon, Rhone Poulenc, Sandoz, Searle, Takeda, Wyeth Ayerst...), small biotech companies (Amylin, Medivir, Peptor, QCB, Zymogenetics...), and academia (Universities of Louisville, Rhode Island, Utrecht, Stanford...) all over the world (Canada, Colombia, Czech Republic, Denmark, England, France, Germany, Israel, Italy, Japan, Korea, Netherlands, Singapore, Sweden, Switzerland, U.S.A....). 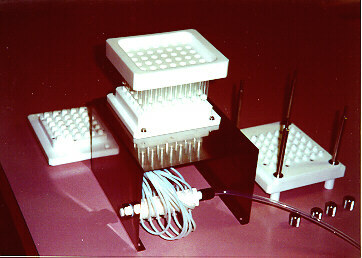 48 REACTOR VERSION WITH REFORMATTING ATTACHMENT FOR DIRECT TRANSFER OF PRODUCTS INTO MICROTITERPLATES IS NOW AVAILABLE ! 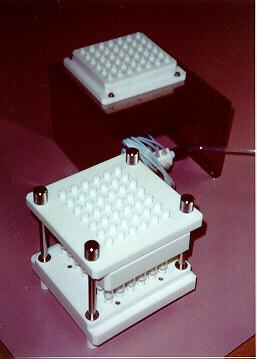 Glass cover used in the randomization step. You can use various coupling reagents, resins,protecting groups in the same run of multistep synthesis. 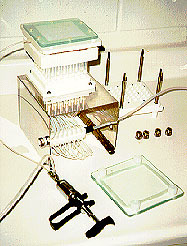 Reactions can be performed in the incubator under elevated temperature, or even in ultrasonic bath (see e.g.Vagner, J., Kocna, P., Krchnak, V.: Peptide Res. 4, 284 (1991)). For more information about the use of MULTIBLOCK we recommend the reading of the User's Manual.